Vancouver, BC……..Corvus Gold Inc. (“Corvus” or the “Company”) - (TSX: KOR, OTCQX: CORVF) announces results from the first two resource expansion Reverse Circulation (RC) holes on the North Sierra Blanca “Starter Pit” target. 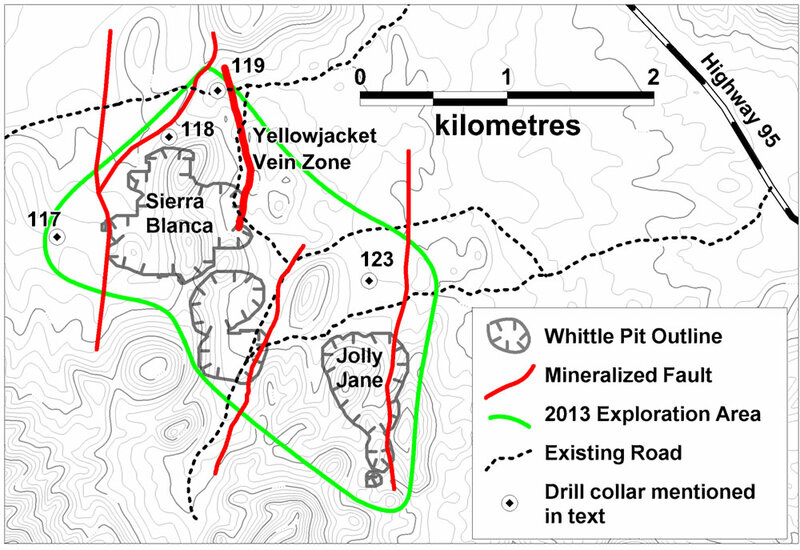 Holes NB-13-219 and NB-13-220 were drilled as 200 metre step-outs to the west and southwest of the previous 2012 scout hole NB-12-119, outside of the currently defined Sierra Blanca Whittle pit. Both holes encountered broad zones of characteristic alteration related to the North Bullfrog gold system and returned broad zones of mineralization similar to the original scout hole NB-12-119 (Figure 1). Both NB-13-219 (67m @ 0.52g/t gold) and NB-13-220 (44m @ 0.62g/t gold) show a normal stratigraphic section with the best grade mineralization developed in the middle Sierra Blanca Tuff unit which starts approximately 75 metres below surface to about 200 metres in depth. The 17m @ 1.05g/t gold intercept in NB-13-219 represents a structure that will be targeted with follow up core drilling for additional Yellow Jacket type high-grade mineralization. Also of interest is the presence of higher grade silver mineralization in the bottom of NB-13-220 (9.2m @ 10.09g/t silver). This could also reflect the presence of additional Yellow Jacket style mineralization in this area. Of importance, the grades of these holes are significantly higher than the average grade within the Sierra Blanca oxidized resource as outlined in the most recent PEA (NR-13-13, June 4, 2013). A further 6 holes completed to date on approximately 100 metre centers have all shown encouraging zones of mineral system alteration over even broader intervals in what appear to be dome-like intrusive bodies. In addition to the drill results, the Company reports that in June formal meetings were held with officials of both the Nevada Department of Environmental Protection and the Bureau of Land Management to discuss the design criteria for the environmental baseline studies that will be required to support the development of a Plan Of Operation and other permit applications for the North Bullfrog mining project. Figure 1: Location of new reverse circulation at North Sierra Blanca. Red labels indicate assays reported in Table 1. Black labels are holes that have been drilled but have assays pending. In 2012 hole NB-12-119 was drilled to evaluate the continuity of the North Bullfrog mineral system to the north of Sierra Blanca Ridge. This hole represented a 350 metre step out from the nearest known mineralization. Results from this hole where extremely encouraging with over 50 metres of mineralization with grades in excess of 0.5g/t gold (Table 1). The objective of the 2013 drill program at North Sierra Blanca is to map the distribution of this higher grade, disseminated mineralization to define a higher grade Starter pit area of the deposit and set the stage for follow up core drilling to look for high-grade Yellow Jacket type structural zones. The 100 metre grid spacing will provide information on the stratigraphy to aid the interpretation of the geophysics data so potential high-grade structures can be more accurately identified for drill testing. Table 1: Significant intercepts* from North Sierra Blanca RC holes. *Intercepts calculated with 0.1g/t cutoff and up to 3m internal waste. Assuming that the mineralization is roughly stratiform in character the intercepts are approximately true thickness. 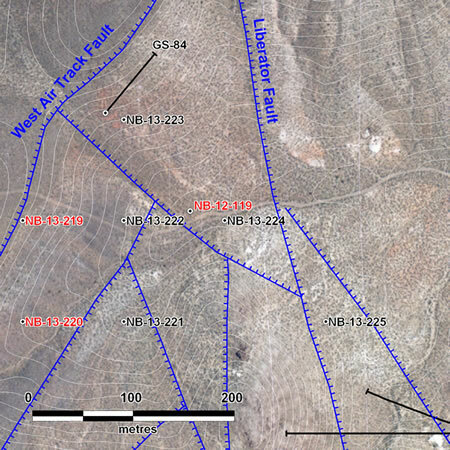 Figure 2: The North Sierra Blanca target is the area located north of the Sierra Blanca resource as reflected by the Whittle Pit outline. Holes NB-12-118 and NB-12-119 were step out holes that highlighted the potential of this area.